Last week Dave and I took Thursday and Friday off work, packed up the car and took off to Algonquin Park for our second camping trip of the summer. See our first camping trip here. It was our first trip here (I went with my grandparents for a drive here a long time ago, but had never camped). We left midmorning with plans to stop along the way for lunch, an ice cream and a stop at the Beer Store. We stopped at Webers in Orillia. It is a mainstay for cottagers. It has been in this place for years and is an institution. We enjoyed our meal on the picnic tables but you can also eat in old train cars. Then we were back on the road until Huntsville where we stopped in to get some beer and then a Kawartha Dairy ice cream. The cone I'm holding is the single, and E has the baby size. Way too much ice cream!! We told him to milk the cow. Didn't bother to wipe his mouth for the photo. We pulled into the campsite around 3:00. 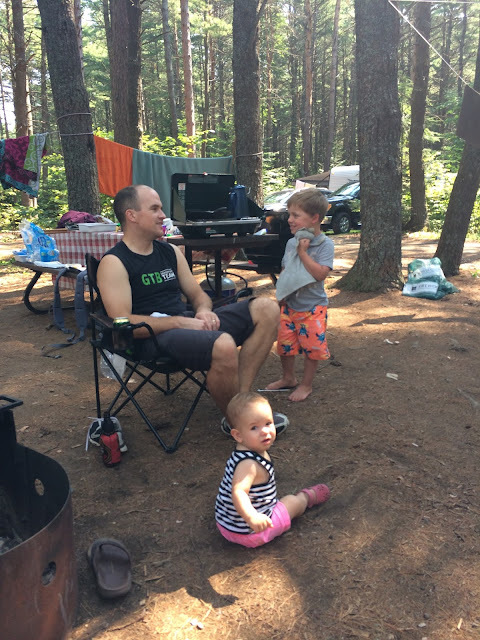 We stayed at Pog Lake (A campground, #181). When we booked our site there weren't many options left. It wasn't the best site but it was fine. Close to the beach and water tap. We saw this sign on our way in, oh my! We got our stuff set up, and then made some supper. I was planning to make kebabs but our skewers were mouldy and I also hate touching raw meat, so I decided to just do a stir fry instead. It was delicious. The next morning was a little cloudy but warm. I went for a run and then after lunch we decided to go for a drive to get an ice cream and do a hike. E fell asleep about 2 minutes into the drive so we sat in the parking lot of the hiking trail for about half an hour while he rested. Then we walked around the Spruce Bog Boardwalk Trail. E did pretty well, he didn't think he could walk all that way but he did (it was only a 1.5 km loop). It was starting to get hot so we grabbed an ice cream cone and headed back to our campsite and to the beach. This is E and I walking over to see the 6 blue jays taking a bird bath by the water tap. It's not a very exciting picture but you'll see why I've included it later. The lake was beautiful and E had a great time swimming and playing in the sand with other kids. Something great about this lake is that there are no motor boats so it is very quiet. Something I didn't really think about until I was sitting there. As we were sitting at the beach we noticed some dark clouds and then heard some rumbling of thunder. I checked our weather and could see the band of thunderstorms coming across the park. We got out of the water but still kept our eye on the dark clouds. And then it started to rain. Dave had put up the tarp over our eating area and near the fire, so we thought we would be fine. E hung out in the back of the vehicle. A sundress isn't the best outfit for a rainstorm but I didn't want to run back to the tent to get my pants. The rain let up for an hour or so. We thought we would be okay. The puddles were draining and we thought we could divert the water from our tent and somehow dry out enough for bedtime. We got the fire going. I made these cast iron frying pan nachos. They were pretty good for being put together during a rainstorm. Unfortunately all of work to divert the water were futile since it started pouring again and didn't let up for several hours. We decided to call it and sleep in the car. Luckily E sleeps in a cot when we camp so Dave and put everything up off the ground of the tent onto the cot so our sleeping bags and clothes were still dry. For all of our years of camping this is the first time we'd ever slept in the car, so I guess we're still doing well. Our family that was coming to camp with us was unfortunately driving in to meet us that night. They showed up mid-rainstorm. They were able to set up a tarp and then pitch their tent on a non-puddled part of the site, so they kept pretty dry overnight. We had to laugh at the situation but that's how it goes sometimes. We did wake up to a beautiful day and had pancakes and sausages. I decided to do some laundry (another camping first for us) and washed and dried all of our wet clothes and towels. Then we rented a canoe and went out on the lake. Then we spent the rest of the day on the beach. E and his cousin. They had fun playing together. This is the before photo of our fire baked apples. While they were cooking E and I ran down to the beach to catch the sunset. We were a little slow so I only got one picture before the sun was gone. The after photo of the apples. They were good. I should have made more. In the morning after breakfast we went down for another canoe ride. Perfect conditions for canoeing when we were out. The wind picked up on our way back. We spent the rest of the day cleaning up our site and packing up. We spent some more time at the beach before heading home. Playing car bingo on the way home. Great time, despite the rain, and great company. (Aside from the rain) the weather was pretty perfect and there were no bugs! Our camping stuff has been packed up for the year but we're hoping to do the same trips next summer.